I want to take a moment to remember Bruce Whitman, 85, a great friend, patriot and recipient of our TopVet Award who recently passed away. Bruce was a proud Air Force Veteran who served as a pilot, navigator and bombardier. He was also a tremendous supporter of Veterans Advantage. In addition to his long-serving CEO position at Flight Safety International (a Berkshire Hathaway company), Bruce was Chairman Emeritus of the Medal of Honor Foundation and served on the Metropolitan USO Board as well as the Wings Club. We celebrate his lifelong commitment to veterans advocacy. He will be missed dearly by all of us who are his fellow veterans, colleagues, and his wonderful family. Over the weekend, Lin and I had the pleasure of attending New York State’s “Veteran of the Year 2018" ceremony. 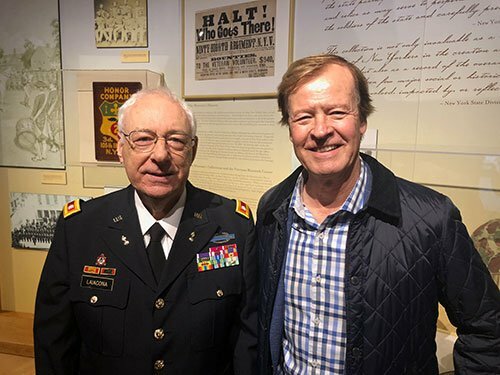 It was an especially moving ceremony, conducted at the New York State Military Museum in Saratoga Springs to honor the service of fellow Vietnam Veteran, LTC (ret) Nicholas M. Laiacona. After Vietnam, Nick went on to serve in Germany, Korea and became one of the first officers in the Army Acquisition Corps. All in, he served with honor for 24 years. Nick’s four sisters also attended the ceremony. Congresswoman Elise Stefanik of New York's 21st congressional district, representatives of the Association of the U.S. Army and the New York National Guard (West Point graduate and BG John Andonie) were also in attendance to participate in the ceremony, and they could not have done a better job. We need more “recognition events” like this one in every state across the country -- be sure to let your elected officials know!